Stud blanks are used as placeholders if you want to temporarily use a threaded horseshoe without studs - e. g. if your horse is living in a group. 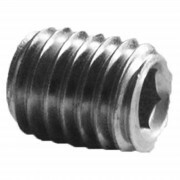 Stud blanks protect the screw threads from getting dirty or damaged and you can easily reapply studs if necessary. For purchases of more than 100 stud blanks, there is a price reduction available.